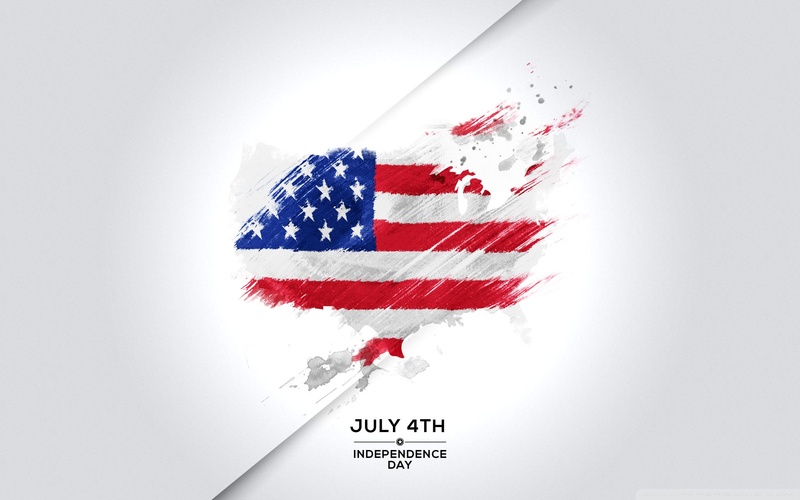 The simple answer is – 4th of July is one of the most important holidays in the US, because it celebrates the declaration of United States’ Independence. It happened on the 4th of July in 1776, when 13 colonies proclaimed to be states, independent from the British Empire. Although independence was proclaimed on the 4th of July, revolutionary war continued until 1783. Parties and fireworks are the most popular ways to celebrate the Independence Day. One huge firework is given by the White House, and, of course, the president and other important government officials give speeches. Many people take a few days off to see their families or escape the loud celebrations and spend a couple days on the beach or their favorite vacation spots. On the 4th of July, American families get together to celebrate political freedom of their country. Traditional annual celebrations include barbecues and picnics, eating hotdogs, watermelon, and other popular food. Well-known sports activities such as baseball games, races, swimming, and tug-of-war competitions are a typical entertainment for this day. The streets and buildings also look festive today. Many people like displaying the national flag outside their houses. In the evening, mesmerizing fireworks light up the sky above the country. People sing patriotic songs and have fun on the streets. TV programs are also special on this day. Normally, they include speeches of politicians, broadcast of the country’s most spectacular fireworks, etc. Independence Day is the day when people celebrate unity, bravery, and liberty. On this day, the citizens focus on the positive aspects of the country’s political life. Prominent politicians visit public events to demonstrate their support for the people, historical heritage, and culture. Independence Day is the time to be thankful for the freedom and liberties people can enjoy. This is also the day to express your gratitude to all the people who fought and made heroic sacrifices for the future generations to be independent and free. The Statue of Liberty is the major monument in the country and a symbol of this holiday. The 4th of July is the federal holiday which means it is observed on the national level. If it is on Saturday or Sunday, public activities are held on Friday or Monday respectively. Since it is a public holiday, most public institutions such as schools and government offices are closed. Many employees also prefer to take a few more days off to have a long vacation. As the result, popular holiday destinations may be jam-packed with tourists these days. Apart from that, many special public events are held on this day. Since the streets are also overcrowded, there are frequent traffic disruptions and changes in public transport schedule. What’s the background of the Independence Day? Prior to the proclamation of the independence states, there were 13 colonies: Maryland, Delaware, Pennsylvania, Connecticut, New Jersey, Massachusetts Bay, New Hampshire, Georgia, Virginia, South Carolina, North Carolina, Providence Plantations, Rhode Island and New York. Colonies were run by the British Empire, which exploited them for resources since 1587. As time passed, tension arose between the British and the new settlers, because British laws and taxes became unbearable. Moreover, the spirit of nationalism was growing in the country, and it was getting stronger with every decade. These tensions sometimes resulted in fighting and dissent acts, like Boston Tea Party in 1773, where the entire shipment of tea was destroyed as a sign of protest against the monopoly which British East India Company had set on sales of tea in the colonies. Tensions became worse after British Empire had reacted to the Boston Tea Party with Coercive Acts, which are also known as ‘Intolerable Acts’. These acts completely took away the power from the Massachusetts colony. As a result, Continental Congresses, which was a meeting of delegates from the Thirteen Colonies, was organized. On the second meeting in 1775, delegates proclaimed the war against the British Empire aiming to obtain independence. One year later, 56 representatives from all self-styled states signed the Declaration of Independence. Among these 56 people, Benjamin Franklin and Thomas Jefferson, who later became presidents, were present. The conflict was exhausted with the signing of the Treaty of Paris in 1783, which proclaimed America to be an independent country. How has it been celebrated through history? Independence Day was celebrated with parties, fireworks, feasts, speeches and general celebrations. A salute of thirteen gunshots, which was symbolic of thirteen states, was shoot on Rhode Island in Bristol in the morning and in the evening in 1777. ‘Psalm of Joy’, which was the 1st recorded music to commemorate the Independence Day was written by Johann Friedrich Peter (North Carolina, Salem). Since 1776, many cities and towns across the country have developed their own unique ways to celebrate the Independence Day. How was it marked by the government? Since 1870 and until 1938, Independence Day was an unpaid national holiday, but following congress’ decision in 1938, it became a paid holiday across the country. People of New England started to fight for their independence from Great Britain in 1775. The next year, on July 2, the Congress voted for independence. This was done secretly. On July 4, the final text of the Declaration of Independence was approved. Four days later, the first public reading of the document was published. In August, delegates signed the Declaration of Independence. Independence Day was initially an unpaid holiday but in 1941 it became the paid one. John Adams, a prominent American politician, was the first to describe how Independence Day should be celebrated. In a letter to his wife Abigail, he mentioned a parade, bonfires, and various sports activities. In 1971, the term “Independence Day” was used for the first time.